West Coast's top draft picks Xavier O'Neill and Luke Foley say they have points to prove after landing at the reigning premier. O'Neill was "hurt" to be overlooked for Vic Metro's under-18s side this year, however it was just the latest in a string of setbacks which spurred him on to a finish the TAC Cup season strongly. 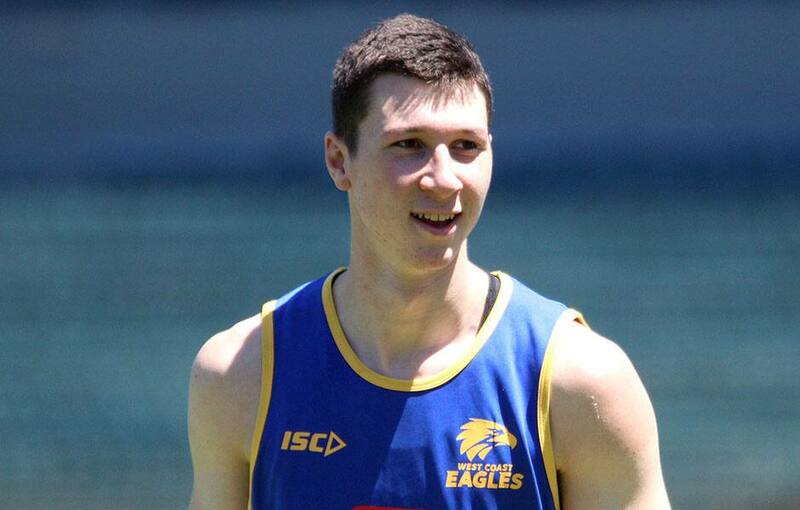 The 18-year-old onballer earned an invite to the NAB AFL Draft Combine – where he finished equal-first in the kicking test – and impressed the Eagles enough for them to swoop with their first selection, No.28 overall. "It was a mental thing over the last three or four years, just getting kicked back a few times from teams and rep squads just gave me extra motivation to get on an AFL list and prove them wrong," O'Neill said. "I think I was equipped to handle that (missing out on Vic Metro) and moved on pretty quick and just focused on playing some good footy at Oakleigh, and just hoped the right people would see it and I'd get an opportunity. "I just set my mind to the end of the year and focused on playing good footy, did some extra touch and skills outside of scheduled training. "Other than that, it was a mindset thing to put it behind me and focus on having a good back end to the season, which I think I did. "It's just getting started now. Getting drafted is obviously a pretty big step, but there's many more to go." Foley, 19, received no interest from AFL clubs last year, and didn't even nominate for the draft, but he put that disappointment behind him this season. The hard-running midfielder enjoyed a standout campaign as an overage player for Subiaco and was a key to the club's colts premiership. Foley's performances for Western Australia at the national championships – when he averaged 17 disposals and eight tackles - got the Eagles' attention and they took the lifelong fan with their second pick, No.31 overall. "I just came in this year with the mindset of wanting to get the best out of myself and really put myself forward. I always had the belief I could get to this stage," Foley said. "There's never guarantees. Going into the draft I didn't know, so I was hoping my name got called out and … I couldn't be happier. "Last year, no interest, no one really came to me and said 'you should be putting your name in (for the draft)', so I didn't think too much of it. "I just knew that this year would be the year. Having a year out of school, doing a bit of part-time work and study, has really been beneficial for me. "So I feel more prepared." O'Neill, an athletic and versatile 185cm midfielder, is looking forward to getting out of his comfort zone after moving interstate, while Foley was thrilled to stay at home in Perth. Both are setting their sights on breaking into an experienced line-up next season, buoyed by West Coast's willingness to blood youngsters this year. "(Coach Adam Simpson) gave me a call the day of the draft, which was good, and said last year there were five first-years that played, so there's no reason why us first-years can't break into the team," Foley said. Foley and O'Neill joined fellow draftees Jarrod Cameron, Harry Edwards and former Collingwood utility Josh Smith for their first training session at Subiaco Oval on Monday. Dandenong Stingrays forward-ruck Bailey Williams doesn't arrive in Perth until tomorrow, while former Gold Coast ruckman Keegan Brooksby is unable to join the club before the pre-season supplemental selection period begins on December 1. Premiership players Jack Darling, Nathan Vardy and Jamie Cripps were back on deck completing extra running ahead of schedule. Willie Rioli and Daniel Venables were notable absentees on Monday, while Liam Duggan ran laps after off-season knee surgery.